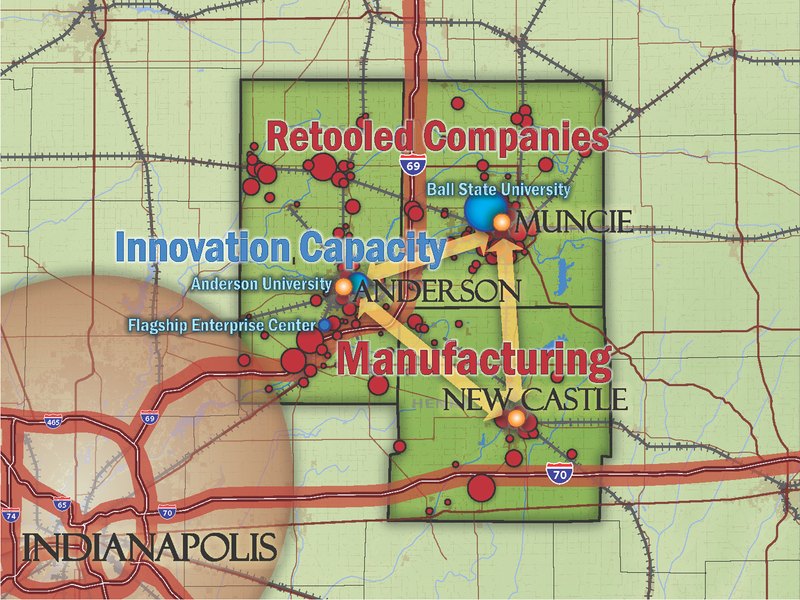 East Central Indiana Economic Vision & Strategic Plan | Vandewalle & Associates, Inc.
Now Anderson, Muncie and New Castle are joining forces to rebuild and reposition the East Central Indiana region and its manufacturing economy for growth and reinvestment. 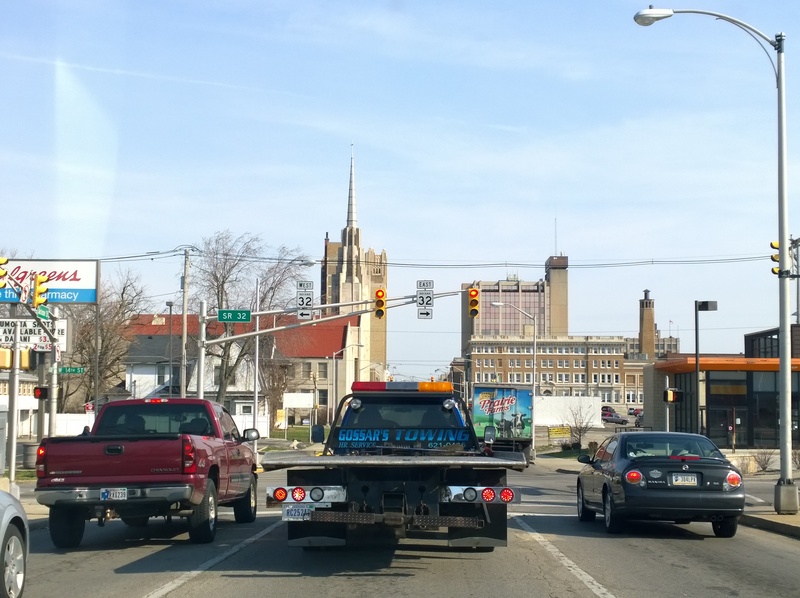 These three cities are the population centers within a 3-county region of nearly 300,000 people in East-Central Indiana, and share a rich history of turning out billions of dollars of manufacturing products for the automotive, appliance, consumer and other markets. 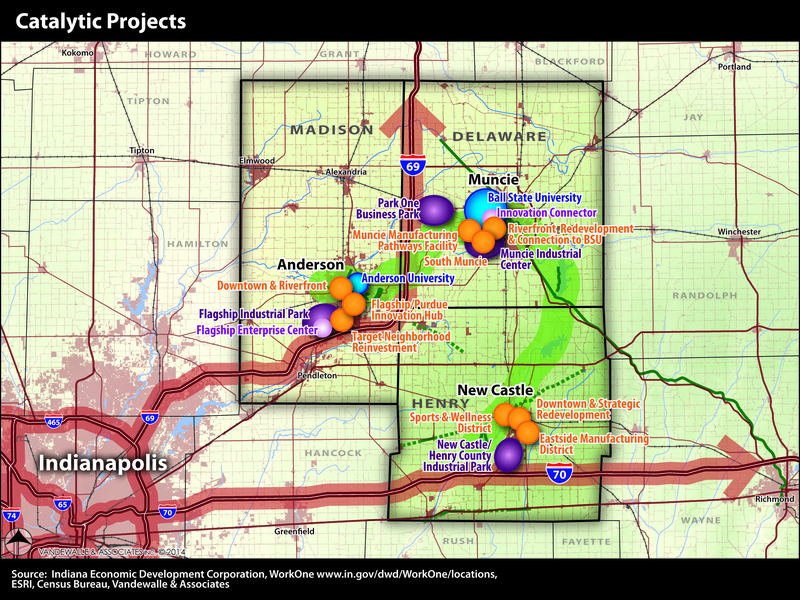 In 2013-2014, Vandewalle & Associates worked with funding from the U.S. EDA as part of the Investing in Manufacturing Communities Partnership to help Anderson, Muncie, and New Castle craft and come together around an assets-based Economic Vision and Manufacturing Strategic Plan. 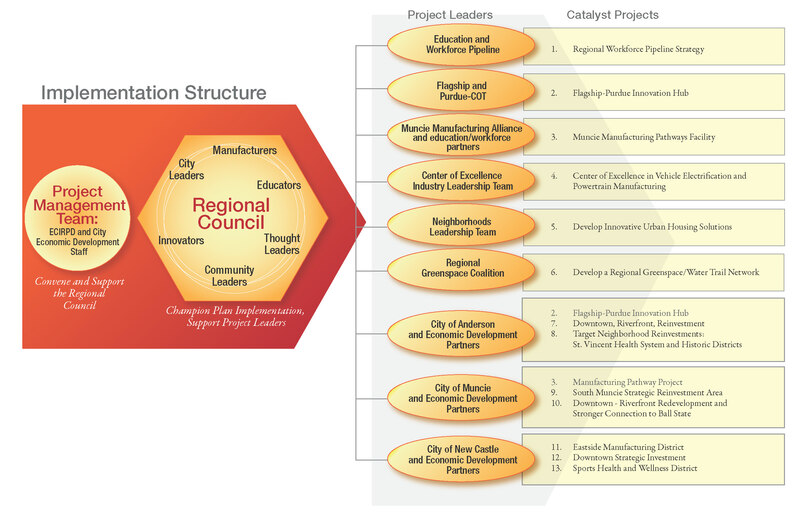 The Plan is a key milestone in a long-term regional collaboration that is working to reposition the region in the future marketplace, providing a clear focus on retooling the education and workforce pathway system along with catalyst projects. Economic Vision and Strategic Framework: articulating a vision and seven Strategic Directions around which regional partners can focus collaborative and individual efforts. Region Building: a process bringing together over 100 people from a diverse array of organizations who can support plan implementation. Regional Council: identifying a public-private partnership approach to implement the Plan and leverage resources and capacities to maximize impact. Funding Targets: identifying programs from eleven federal agencies that the region can specifically target to fund elements of this Plan, and helping the region write applications to receive these funds. 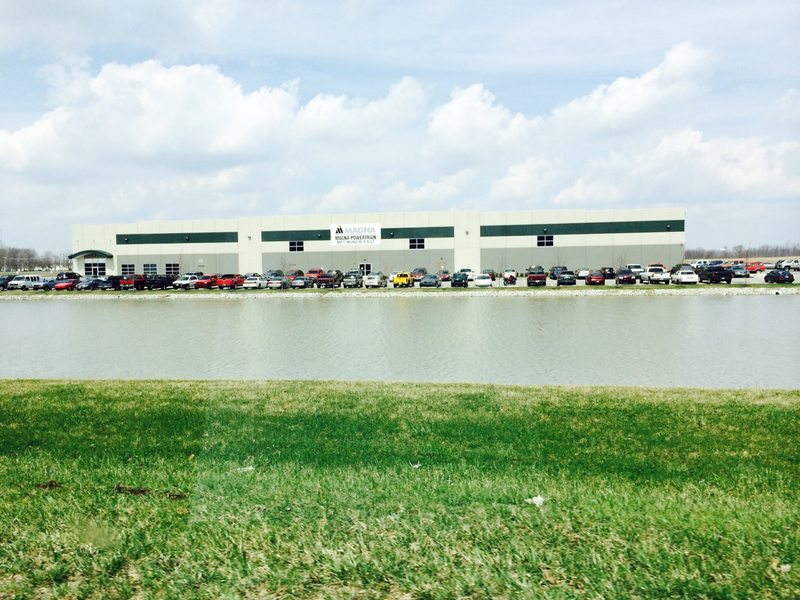 From this work, the ECIRPD region received designation as an Investing in Manufacturing Communities Partnership (IMCP) community, the only such designation granted in Indiana. Education and Workforce Pipeline Strategy. This strategy provides a clear focus on retooling the workforce pathway system in the Region, preparing the current and future workforce to for well-paying new economy jobs. Innovation Ecosystem. Vandewalle & Associates worked with the ECIRPD to leverage the region’s assets in engineering, design, talent and access to capital. This work is creating a regional innovation ecosystem that strengthens collaboration and marketplace presence and develops the region’s presence as a global Vehicle Electrification and Powertrain Manufacturing Center of Excellence. Messaging and Communications: developing messaging and communications tools that project stakeholders can use to communicate the plan and status of implementation. 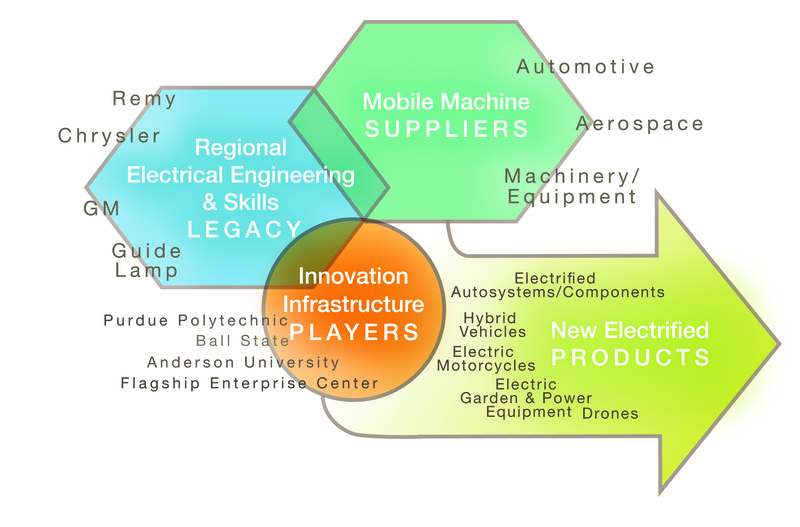 Strategic Catalyst Projects. 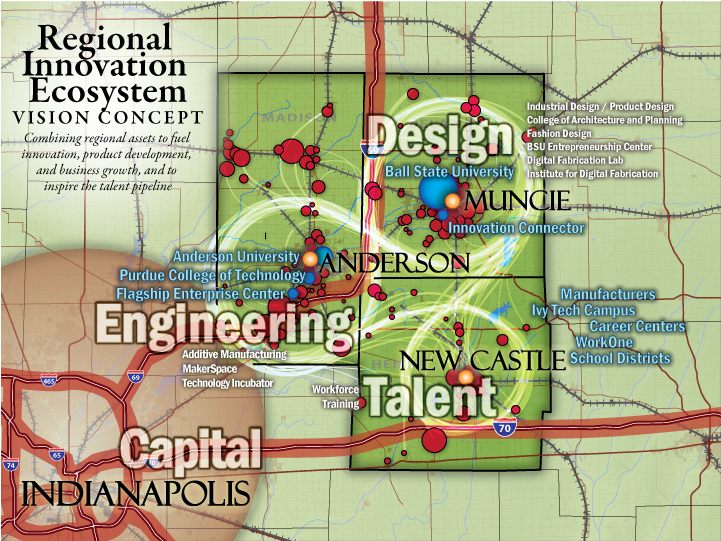 Work has begun on implementing a series of catalytic projects that are building the Innovation Ecosystem and reinvesting in the region, such as the Flagship-Purdue Innovation Hub. 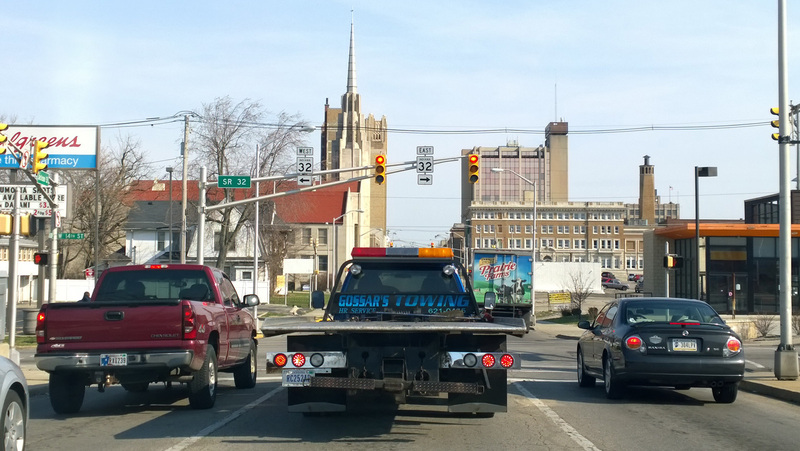 Additionally, catalyst projects in each of the three cities offer the potential to spark additional reinvestment in downtowns, neighborhoods, and employment centers.